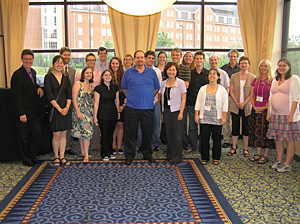 June 1, 2010–The Center for Bioinformatics and Computational Biology (CBCB) at the University of Delaware hosted the first Skate Genome Annotation Workshop at Clayton Hall from May 24-28. 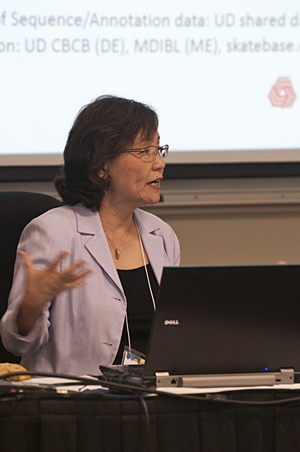 Cathy Wu, Edward G. Jefferson Chair of Bioinformatics and Computational Biology, addresses those attending the workshop. James Vincent, research assistant professor of biology and director of the Bioinformatics Core for the Vermont Genetics Network, speaks. The workshop included presentations and a tour of the DNA Sequencing and Genotyping Center at the Delaware Biotechnology Institute. A group shot of workshop attendees. 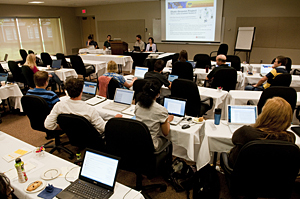 The five-day, hands-on bioinformatics workshop was sponsored by the Northeast Cyberinfrastructure Consortium (NECC), which is aimed at developing cyberinfrastructure across New Hampshire, Maine, Rhode Island, Vermont, and Delaware and using this broadband network for cyber-enabled research programs. The workshop, which drew 27 participants and 10 instructors from universities and colleges in the NECC states, was the first of three bioinformatics workshops planned to annotate the genome of the little skate, Leucoraja erinacea. The skate is one of 11 strategically selected non-mammalian organisms determined by a National Human Genome Research Institute panel to have the greatest potential to fill crucial gaps in human biomedical knowledge. Each of the chosen species represents a position on the evolutionary timeline marked by important innovations in animal anatomy, physiology, development, or behavior. 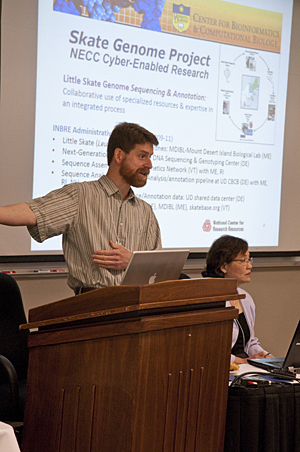 “This workshop was the inaugural event of a two-year effort to sequence and annotate the skate genome,” said Cathy Wu, Edward G. Jefferson Chair of Bioinformatics and Computational Biology at UD and chair of the workshop. “There is again a need for training a new brand of scientists who are both expert experimentalists and computationally savvy,” he said. As part of the workshop agenda, participants had the opportunity to visit DBI’s DNA Sequencing and Genotyping Center, where center director Brewster Kingham provided hands-on demonstrations of the high-throughput sequencing capabilities of the Illumina Genome Analyzer. “The collaborative sequencing and annotation of the skate genome is an ideal project for us to explore and test the capabilities of our growing network,” said Karl Steiner, senior associate provost for research development at UD and principal investigator of the Delaware INBRE (IDeA Networks of Biomedical Research) grant funded by the National Institutes of Health, which provided support for the workshop through administrative supplements to the INBRE programs in the five participating states. The participants were selected from a pool of more than 50 applicants to receive travel awards from the INBRE administrative supplement to attend the workshop. “I feel that this workshop has opened my eyes to the field of bioinformatics and inspired me to look further into what it is all about, possibly exploring it as a career,” said one participant. The workshop tutorials are available online at the CBCB website for students and researchers who are interested in learning more about genome annotation.